January 2002 was a hectic month for us. We had the league and the FIFA World Club Championships to contemplate with. With such a busy schedule, injuries were bound to happen and they did. My squad was crippled with news that Vieira, Stepanovs, Parlour, Vernazza, Wiltord and Lauren joined Henry on the injury list. Lucky for me, my youth policy worked and several players from the Reserves got an extended run in the first team. Arsenal came up against unfamiliar teams and different styles of play in the form of Mamelodi Sundown (South Africa), Kashima Antlers (Japan) and Vasco da Gama (Brazil). The Brazilian heat took a toll on the players too. I was wondering whether I made the wrong decision to take part but fortunately it turned out to be one of my best decision. 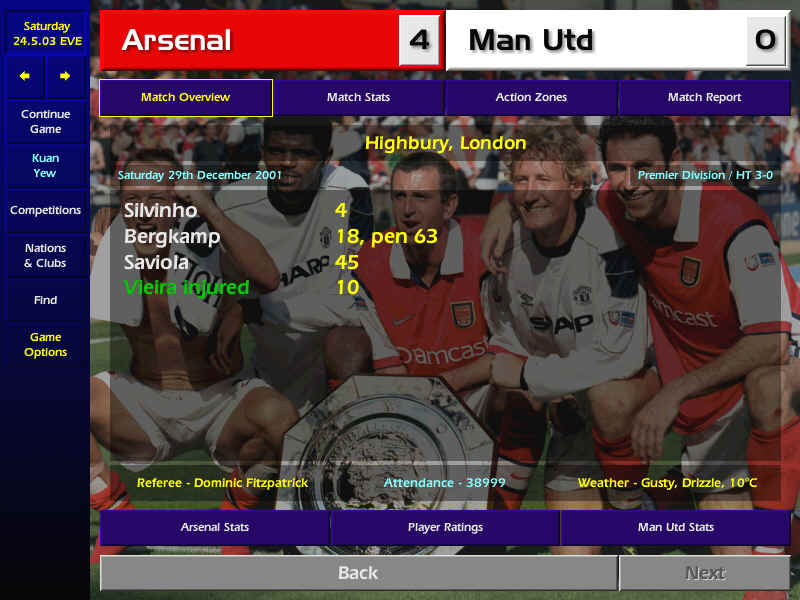 Arsenal qualified for the Final against Real Madrid after seeing off Sundown (2-0), Antlers (2-0) and Vasco (1-0). I made a few bargain buys in the transfer market to strengthen my ailing defense. John O'Shea (Manchester United) and Paul Robinson (Leeds) joined for £325k and £675k respectively. Future England custodian Richard Wright (Ipswich) will be joining for free next season. Elsewhere, Sir Alex Ferguson resigned as United's manager after seeing his side languishing above the relegation zone. My Reserve team managed to eliminate Sunderland 3-1 on aggregate in the League Cup semi-final match. It was a hard fought battle over 2 legs. We rejoined the FA Cup in the 5th Round facing Grimsby. A win later saw us taking on Brentford in the quarterfinals. Henry rejoined the team after his lengthy injury layoff and scored a brace against Blackburn. Looks like I won't have to worry about his form after all. The Champions League resumed and Arsenal were held to a goalless away draw against Spartak Moscow. But we regained the upper hand when we defeated them 4-2 a week later. A win over Celtic (2-0) and we were up against Milan. The match wasn't short of any excitement despite the 0-0 score line. The Quarterfinal draw saw us facing FC Porto again. In the league, Chelsea broke our unbeaten record of 24 matches when they stretched theirs to 26 matches. Despite the fact that they looked virtually unbeatable, we still held an 11-point advantage over them. Lucky for me, we haven't had a rough patch. Our performances were quite consistent despite having a few injuries to contend with. With 10 more matches to go, we were ahead with 22 wins, 5 draws and 1 defeat as compared to Chelsea's 17 wins, 9 draws and 2 defeats. One of the highlights during the month of April was our Champions League Quarterfinal match against FC Porto. We had a tough encounter last season at the same stage and there was no difference this time around. 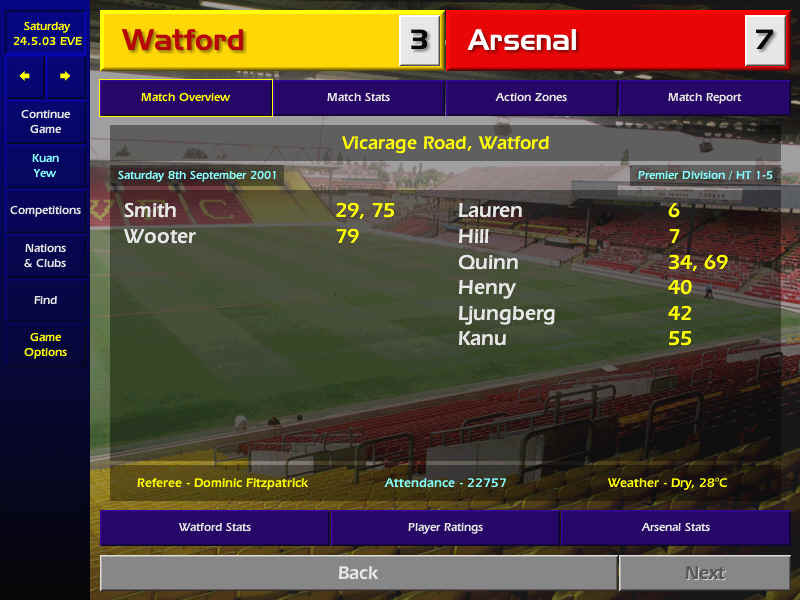 We beat them 1-0 away before holding out to a 1-1 draw at Highbury. Liverpool was our FA Cup Semi-Final opponent but despite Heskey's 11th minute opener, they were soon 3-1 down at half time with goals by Bergkamp, Greening and Quinn. Their comeback was further hampered when Henchoz was sent off. Arsenal scored once more through Lauren and we were cruising into the Final.